ANCHORAGE, Alaska was rocked by a magnitude 7 earthquake early in the morning of Nov. 30—and was then shaken further by almost 200 aftershocks. Miraculously, no one was killed, but hospitals have been treating numerous patients for minor injuries, mostly lacerations caused by broken glass, and at least one broken bone. One person suffered severe burns after breathing in flames while fighting a fire in his home, caused by the quake, Anchorage Daily News reported. Governor Bill Walker declared a state of disaster a few hours after the first shocks were felt. 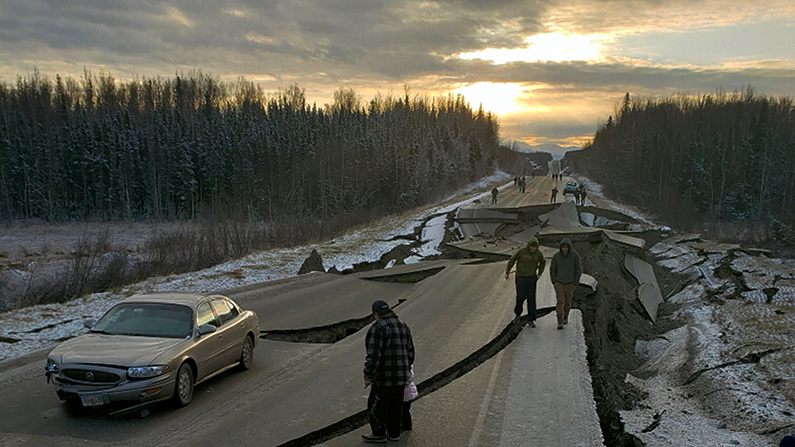 According to seismologists, Alaska hasn’t felt an earthquake this power since 1964. “What happened in Anchorage was an emotionally disturbing event, a lot of people were very scared,” state seismologist Michael West told Anchorage Daily News. Descriptions of the damage cannot convey the power of this event. Luckily, in this age of ubiquitous cell-phone cameras, there are numerous photographs and video clips that can convey the power of these earthquakes and aftershocks, and which can evoke some of the emotions residents felt when their world started shaking. Some of the aftershocks register 5 on the Richter scale, with the strongest hitting 5.7. While the region’s population went mostly unscathed, the infrastructure did not fare so well. Roads were ripped and twisted, and bridges collapsed from the upheavals. Governor Walker told AP he expected it would take more than a week or two to repair all the damaged roads. Most of the buildings held up, though most things on shelves or hanging on walls ended up on the floor. “The amount of infrastructure damage has been mitigated in large part by how we build things here and the level of preparation,” Anchorage Mayor Ethan Berkowitz told reporters after the quake. Many residents in the region lost power, but it had mostly been restored by the next morning. 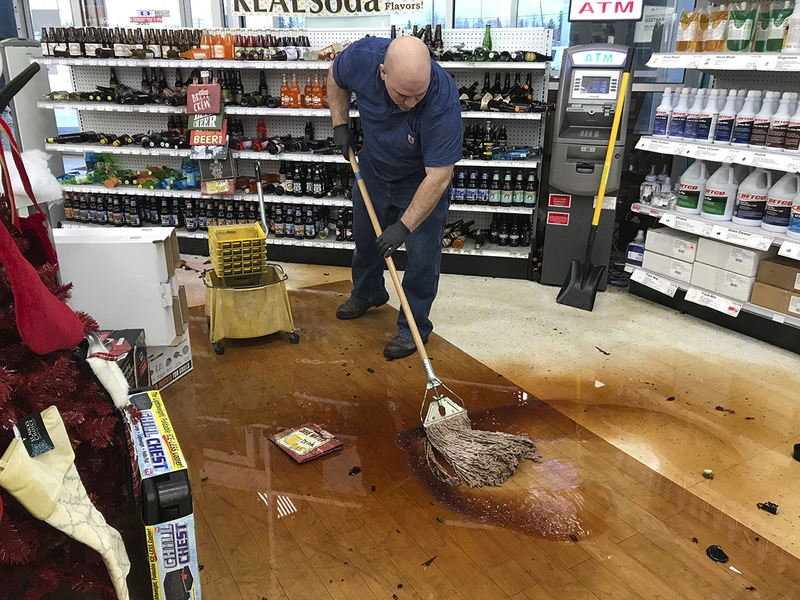 Anchorage Municipal Manager Bill Falsey told AP that his workers were responding to reports of 28 water main ruptures, some of which flooded homes. Schools were closed Friday. Some were damaged considerably. Alaskans were lucky that the state’s normal wintry weather has held off so far. The temperature has been at least ten degrees above the norm for early December—instead of sheets of ice covering the streets, Anchorage residents are walking through puddles. The unseasonably warm weather will make clean-up a little more pleasant, and will possibly speed up road repair, as the ground isn’t frozen harder than iron. Snow started to fall lightly immediately after the first quake, but weekend highs should be in the mid-30s, Accuweather reported.